The core of each crane facility - the pulley block! We do not only develop with passion for detail but we do also design them with safety and expert know-how. Always planned for the corresponding operational environment, protected from corrosion, heat, dust and moisture - conceived for hard continuous use. 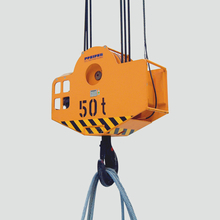 Perfectly tailored for the carrying capacity and hoist drive classification - simply the core.